Ok, Ok, Maybe a Good Day To Be Off The Bikes – Run. Ride. Roam. When we looked out the window this morning, we saw grey skies and wind, lots of wind. “We wouldn’t like the look of that if we were on the bikes,” I commented to Steve. 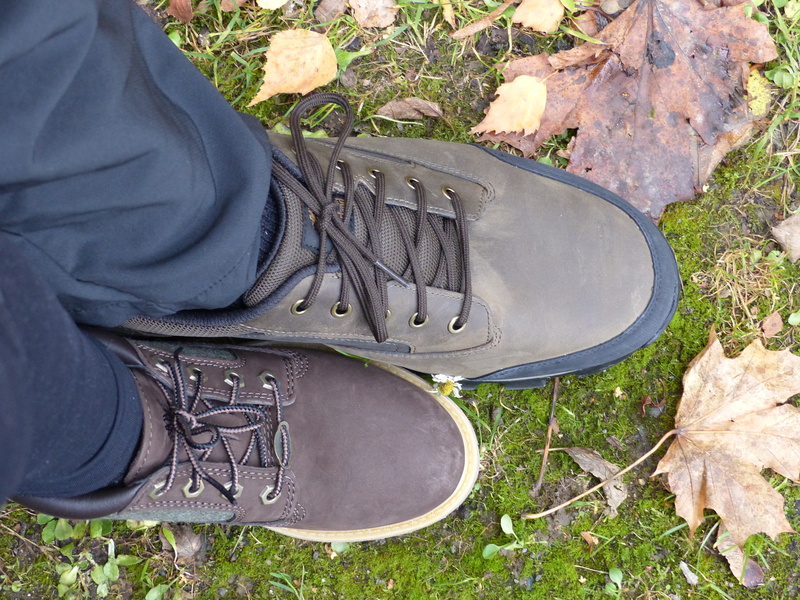 It turns out the new shoes were well timed because it rained when we arrived in St. Quentin last night and it was cold and wintery today. A day for shoes over sandals me thinks. Little n’ Large ready for action! Our drive took us along the areas that were sites of battles during WWI and we saw many signs for Commonwealth War Cemeteries and memorials. Just as I did when we rode through these areas, I looked across at the landscape and pictured this green, rolling, peaceful environment, as the quagmire of hell that it was during the battles of the Western Front. What a stark contrast it was today and even under grey skies, that scenery and countryside was beautiful. We drove through Masnieres, which had an interesting story to tell. 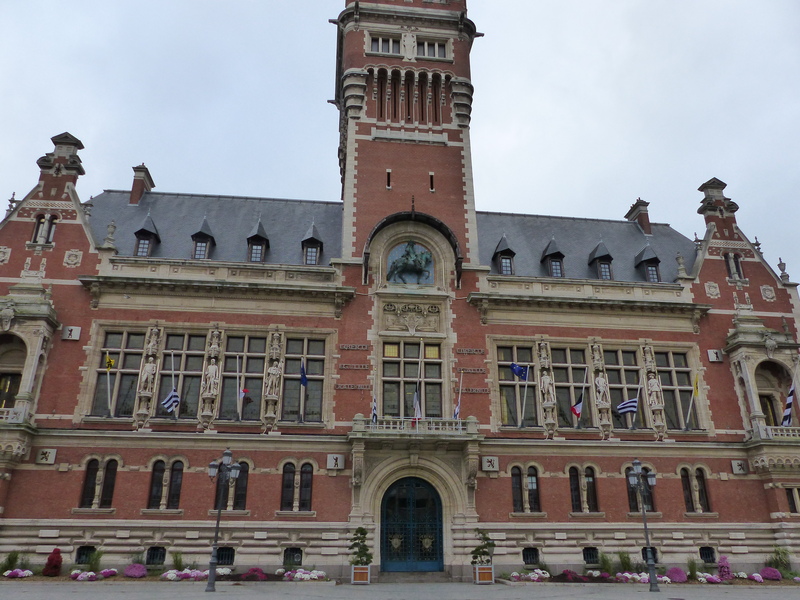 It was the site of some fierce fighting on November 20, 1917 when Allied forces entered the town, led by Major Philip Hammond and a dozen tanks. They immediately came under fire from enemy machine guns hidden in the town’s narrow streets and alleys. One of the tanks made it through and attempted to cross the bridge into the town, but having been mined, the bridge collapsed and the progress of the tanks was halted. The Newfoundlanders managed to get across the canal on foot, but came under heavy fire from the nearby ridge. A temporary bridge was built, allowing the “Fort Garry Horse” Canadian cavalry regiment to get across, but it took heavy losses and with no support, was forced to withdraw. Despite all this, the British were eventually able to occupy the village, but fierce counterattacks forced the decision to withdraw from Masnieres. 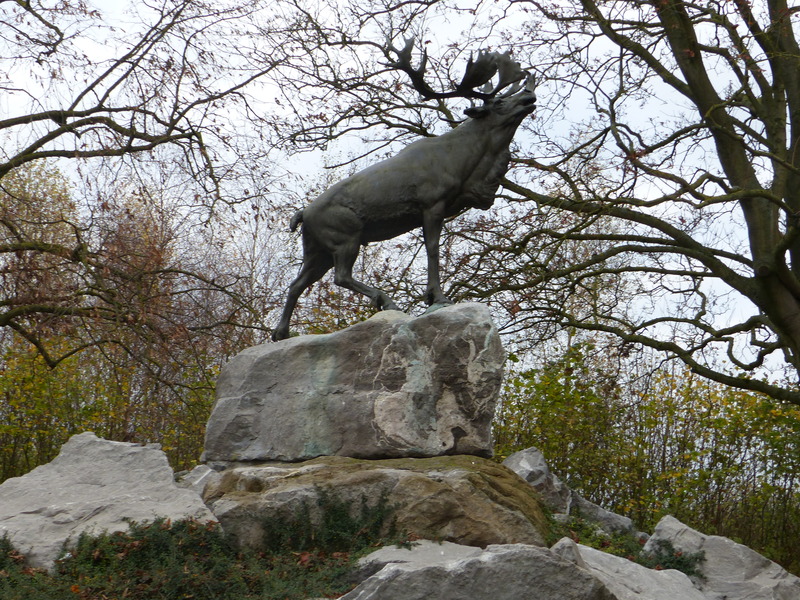 The large monument of the bronze caribou, the emblem of the Newfoundland regiment, is in recognition of the Allies’ final advance during this fierce battle. We continued on and the wind was certainly in a mood today. Even the van was getting a hammering and rocking side to side, the wind was so fierce. Not a day to be on the bikes! We did have a “James moment” though, to replace our usual “Dave specials” that we tend to have thanks to Dodgy Dave the GPS. As we drove along the main road, James’ soothing, British voice, calmly instructed us to “Turn right”. Aaah, James, there is no road on our right! There’s a paddock! A very big paddock! In facts miles and miles of fields! “Turn right” James repeated, because obviously the two dolts he is trying to direct mustn’t have heard him the first time. But…all we had on our right was green…acres and acres of green fields! Short of leaping a fence like a feral van impersonating a galloper in the Grand National, there was no right turning to be done! James began to get a bit frustrated, because he continued with his instruction to “Turn right” “Turn right” “Turn right!!! !” I think James may have been out with Dave and after having one two many beers, started to listen to Dave’s navigational stories and misguided wisdom about how to direct people! Sorry James, but you were being a complete plonker and we chose to ignore you! Don’t listen to Dave! He’s a dodo! As we drove along we saw lots of canals and bike paths and it was a sweet reminder of our lovely cycling days along the canals. We’ve also seen lots of cycle paths beside the road, which we would have been very grateful for if we’d been on two wheels. 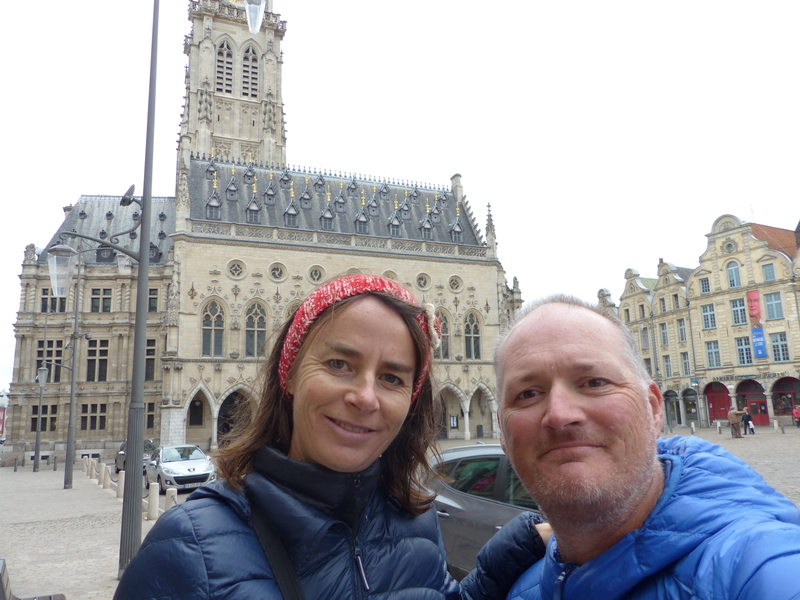 We saw on the map that we were close to Arras, so decided to take a detour to have a look at this town, which we had heard was worth a visit. Entering the main square was a gorgeous sight. 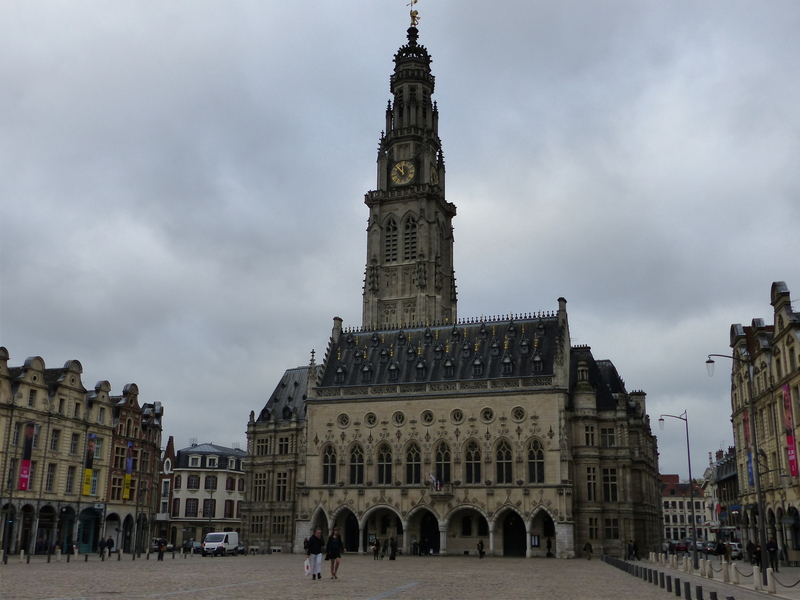 The buildings are all Flemish in design and the architectural style of the whole town, was stunning. 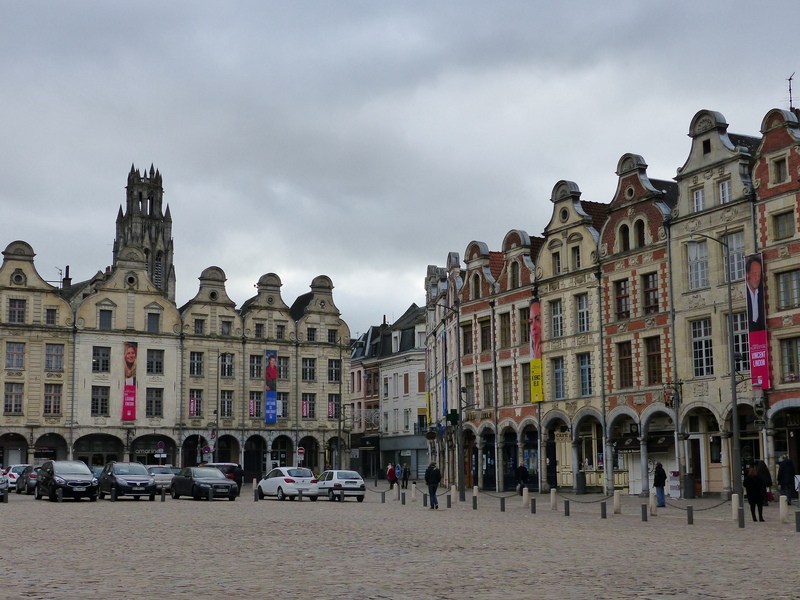 It was just a pity that the main square, La Grand’ Place, was a car park, which did detract from the lovely surroundings. It would have been nice if it was pedestrianised, like the Italian piazzas or other grand squares we’ve seen in France, such as in Toulouse. The smaller square was closed to traffic though, which was nice, and with the tall church at the end, this square, known as, La Place des Héros, (also called La Petite Place), was just lovely. 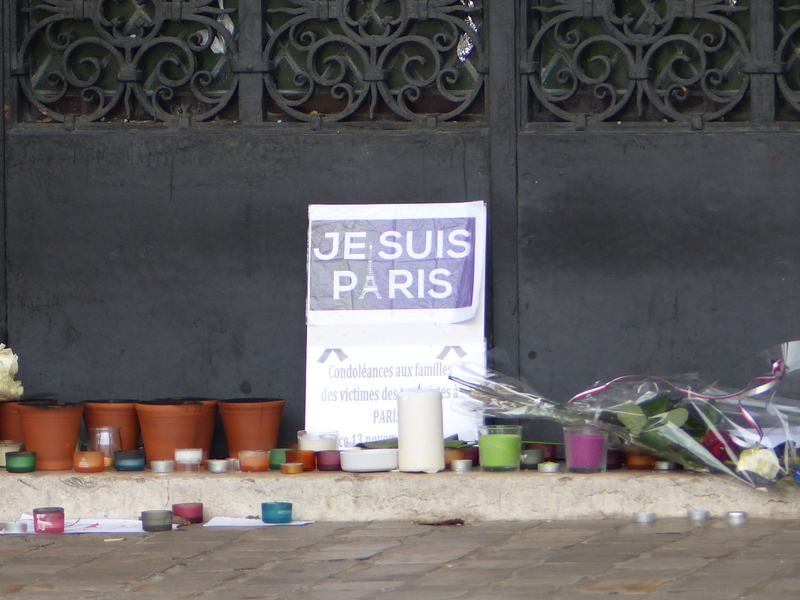 In the entrance to the church, we saw a tribute to the victims of the recent attacks in Paris. Solidarité, read one sign. 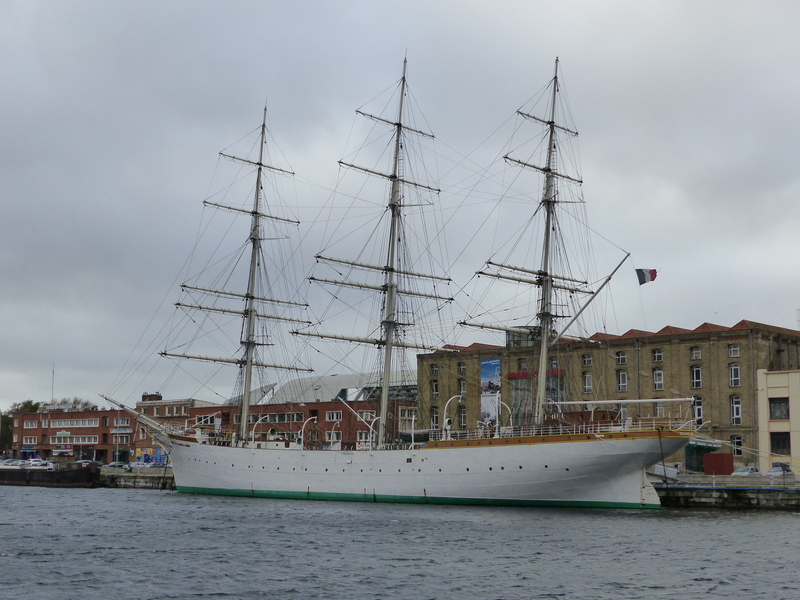 On we went and before too long we reached Dunkerque and did a wild and windy walk around some streets to have a look at the buildings and waterfront. Then it was on to our hotel, to settle in before our final leg tomorrow. It was a nice day, because I liked stopping in towns again, to learn some more history about places and events. So even though we were cooped up in a van, we got to see some interesting places and learn some new stories. It was also a day that wouldn’t have made for fun riding, so I didn’t feel so bad about being in motorised transport. We also had that stunning scenery again and I kept remarking to Steve, “That green! Look at that green! We don’t have that shade of green at home!” Tomorrow, if all goes to plan, we should be arriving on British soil again. Whenever we have some sort of additional transport involved, such as trains or ferries, I’m always a little nervous about there being a glitch in the plan! Tomorrow should be a ferry crossing, so hopefully that will all go smoothly (both plans and the crossing!). We’ve only had these few additional days in France, essentially in transit to another destination, but it’s been wonderful. It’s been such a nice reminder of the features of this country that we loved so much the first time. As well as the scenery, towns and villages we’ve seen, it’s been the people again who have made our visit special. The people are warm and friendly and kind and endlessly gracious during attempts at communication. We have wonderful memories of France and this short, bonus visit, has just added to them. The events in Paris have been shocking, but we continue to see the beauty and magic of this country. The memory bank has been topped up again, with new experiences and pleasant reminders of those from the past. That bank is ours and ours alone, and the riches it holds are priceless!